CNT evo MM Series | CSM Products, Inc. The CNT evo is a high-precision measurement module designed for measuring frequencies, pulse widths, incremental displacement measurements, rotation angles, position measurement, event counting and period measurements. 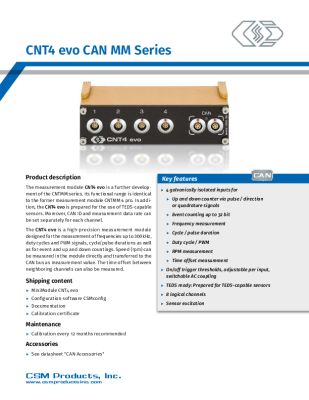 The measurement module CNT4 evo is a further development of the CNTMM series. Its functional range is identical to the former measurement module CNTMM 4 pro. In addition, the CNT4 evo is prepared for the use of TEDS-capable sensors. Moreover, CAN ID and measurement data rate can be set separately for each channel. Up and down counting via pulse/direction or quadrature signal. Each physical channel can read two measurement values simultaneously, which means that CNT evo modules provide eight logical channels. On/off trigger thresholds are adjustable per channel and feature a switchable AC coupling. Also, these modules are equipped with a galvanically isolated sensor excitation. You are already using the measurement modules CNTMM 4 classic and pro and would like to know which of the CNT4 evo modules would be a possible successor? Just have a look here. Allround measurement modules for sensors with analog voltage outputs: CSM’s AD MiniModules (ADMM) offer a wide range of applications for measuring analogue signals (voltage, current, pressure, flow rate, etc.). CSM’s Thermo MiniModules (THMM) allow precise distributed temperature measurements with K-, J- and T-type thermocouples: ideal for measurements in the powertrain, on HVAC (Heating, Ventilation, and Air-Conditioning) components, in the vehicle interior, the powertrain development and many more. Regardless of whether it involves measurements of oil circuit pressure, the flow rate in the cooling circuit or a vehicle's ground clearance, many sensors convert their respective measured quantity into an analog voltage which can be processed in one of CSM's analog measurement modules. The optimisation of processes in the engine, the clutch and further components of the powertrain help to improve the performance and the smooth running of an engine and to reduce its emissions.